I used to love watching films about naughty school children, not least because I considered myself to be one and delighted in any opportunity to prove it. At primary school my finest (or least fine, depending on which side of the fence you sit in the morality stakes) moment was when my best friend and I managed to flood the toilets by sneaking out of morning assembly, putting plugs in all the sinks, turning the water on full and then slipping back into the room again before anyone noticed. Hours later, when the headmistress hauled the entire school back into the hall and demanded a confession – threatening everyone with punishment should the guilty parties not step forward – we merely sat with serene expressions as a murmur of discontent ran through the crowd. 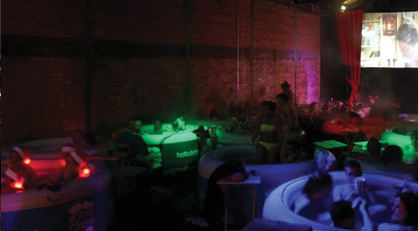 But getting back to hot tub cinema; what a concept! If only I’d thought of it myself! Find a roof top or deserted warehouse, hire a big screen projector and a handful of hot tubs and market your event as a time-limited opportunity for groups of hip Londoners to watch classic films whilst wearing wigs and other ridiculous theme-related paraphernalia. Add to the (already not cheap at £28 a head) mix a licensed bar and you have got a money spinning scheme of which your parents (or at the very least your peers) would be proud. If tonight’s half as cool as this I’ll be delighted! This entry was posted in Uncategorized and tagged classic films, confession, eighties, ferris bueller's day off, headmistress, hot tub cinema, naughty children, primary school by Belle365. Bookmark the permalink.